Study equine management online. Learn about horse care, horse psychology, pasture management, stable design, and more. Do you want to learn more than just the basics of horse care? Is your dream to be a professional in this field? Are you working in this field and need a good solid qualification? This course is right for you - whether you are starting at the bottom or want to progress in your current role. This course is designed to equip managers, supervisors, or people who want to work up to these positions within the industry (e.g. at a riding school, race track, stud, farm etc.) with the necessary management skills required to undertake such a role. 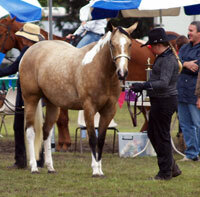 It is an "experiential based" learning program which will get you involved with the equine industry as you study. For ongoing success in the equine industry you need to become "connected" and remain "connected", so that you can see and adapt to recent changes, and ongoing changes as your career moves forward. The four Core business modules and three horse care units are combined with your selection of two general studies elective units. The choice of electives allows you to integrate the knowledge you gain through "real-life" or relevant experiences in equine workplaces or through undertaking focused Research Projects that are directed toward your specific goals and interests. These modules provide foundation knowledge for the Advanced Certificate in Applied Management (Horses). Note that each module in the Advanced Certificate in Applied Management (Horses) is a short course in its own right, and may be studied separately. If you work in the industry that you have been studying; you may submit a reference from your employer, in an effort to satisfy this industry (ie. workplace project) requirement. Through knowledge of natural equine behaviour we can obtain insights into how a horse should be handled. Domesticated horses are subjected to unnatural intervention and influence by humans. Problems in horse behaviour (discussed in later lessons) are usually due to not understanding the inborn behavioural needs and not adequately providing for those genetically driven needs. Though true wild horses don’t exist, there are domestic horses which do exist in the wild. By studying the behaviour patterns of such horses (and other wild equines such as zebra’s) it is possible to develop a strong insight into inborn behaviour patterns. Natural herds are normally up to 20 individuals (either a stallion and mares, or a bachelor group. Sometimes an animal will become a loner (due to others dying, or being excluded from a group). Loners tend to join new groups or die early. Horses have an ability to form friendships with each other (and people); which can be sustained for life. Friendships are not determined by rank. In nature, a stallion normally holds the highest rank, followed by a dominant mare (usually older and stronger. Stronger, more experienced and fitter animals are dominant over weaker ones. Psychological factors as well as physical characteristics can contribute to rank; and it is possible for a smaller animal to rank higher than a larger one. Higher ranked animals have privileges over lower ones. Some authorities consider rank to be primarily inborn, but others believe it is more a learned behaviour. Individual distance parameters develop (in accord with rank) between individual horses in any group. Foals will maintain a relatively close distance to their mothers of coarse, but horses at opposite ends of the rankings in a herd will maintain a greater distance apart than those closer to each other in rank. Aggressive behaviour is in response to situations that arise. Without the stimuli, naturally aggressive animals may not demonstrate a great deal of aggression anyway. Horses will occupy a range but are not “territorial”, so meetings between herds (or stallions) are often relatively peaceful. During mating season however, serious fighting can occur between competing stallions. Anyone might get a job as a farm labourer, or mucking out stables, but if you want a sustainable and exciting career, plus a good, well paid job - then you need a higher level of knowledge and skill, plus a sound understanding of the scope and nature of the equine industry. This course helps you to achieve that. Success in the equine industry is not just a matter of being able to do the job. It is also very much dependent upon the attitude you have and the decisions you make. With the strong foundation gained through this course, you will have a great standing for a successful career in equine management. Where can you work when you have finished this course? Let us help YOU towards working in your dream job!